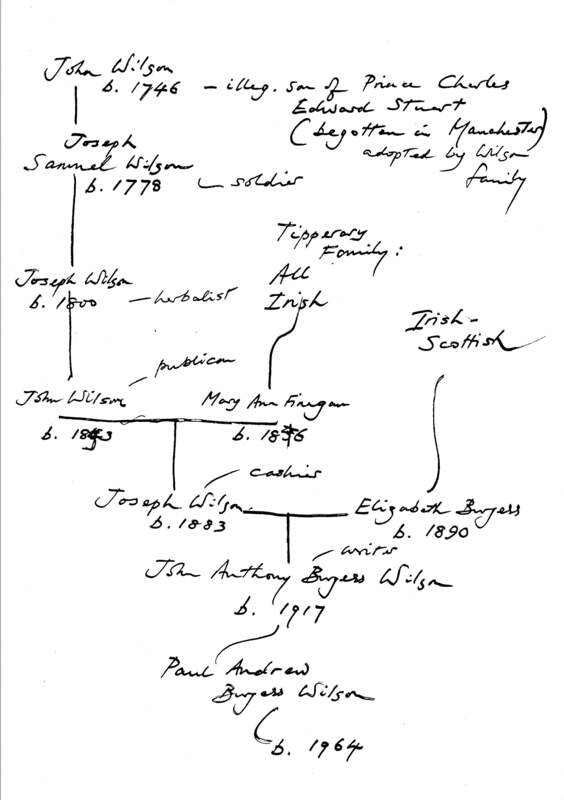 This is a sketch of a family tree by Anthony Burgess, which seems to have been drawn up for the benefit of his son ‘Paul Andrew Burgess Wilson’ (1964-2002). 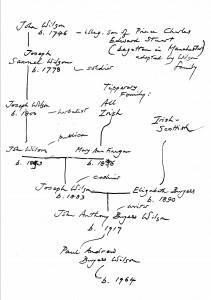 Andrew Burgess Wilson, as he called himself in adult life, became interested in whether or not he had Scottish and Irish heritage, and Burgess – who refers to his own possibly Celtic origins many times throughout his writings – here speculates about what it might have looked like. This sketch was clearly not for publication and looks rather like a private joke. While there is no evidence that Burgess’s great-great-great-grandfather was the illegitimate son, ‘begotten in Manchester’, of Prince Charles Edward Stuart (Bonnie Prince Charlie), there is no evidence that he was not, either. Burgess’s listing of the occupations of those on the Wilson side of the family may be based on memories from his father, who was indeed a cashier at the beef market in Manchester, and his grandfather who was a publican; or they may be colourful surmise. It is interesting to note that Burgess has little to include here about his mother Elizabeth’s family, about whom – as he says in his autobiography – he knew almost nothing. Elizabeth died with Burgess’s elder sister Muriel (not mentioned here) in the influenza outbreak of 1918, when Burgess was just one year old.